The world’s #1 lash adhesive and world’s best-selling false eyelashes are available for the first time together! 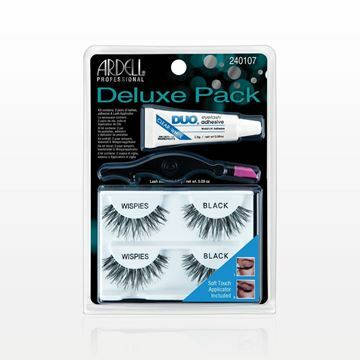 This Deluxe Pack includes two pairs of Ardell® Wispies False Eyelashes, one travel sized DUO® Eyelash Adhesive in Clear/White (0.09 oz., 2.5 grams) and a soft-touch lash applicator to quickly and effortlessly adjust and apply lashes. 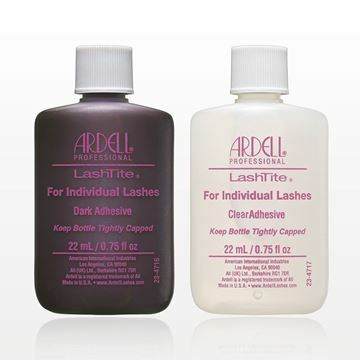 Ardell® false eyelashes have been a favorite of professional makeup artists for decades. The Professional Natural False Eyelashes feature an invisible, lightweight band that connects the hair strands to form a strip that ensures secure corners. They are knotted and feathered by hand for perfect uniformity and absolute comfort for a beautiful natural look. 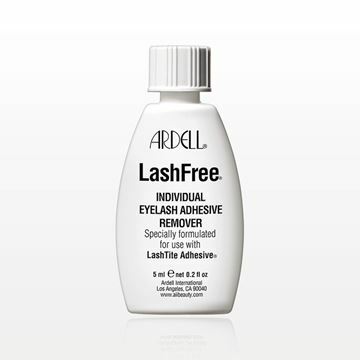 Ardell® Professional LashFree® Individual Eyelash Adhesive Remover quickly dissolves adhesive in the safest, easiest way. 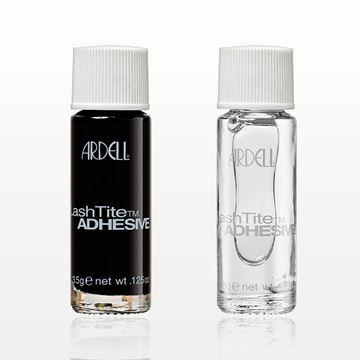 Specially formulated for use with Ardell® Professional Lashtite® Adhesive. Usage: Do one eye at a time and place tissue over the lower lid and partially close your eye. Dip an eyeliner brush into LashFree® and gently stroke along the lash line until adhesive softens. Then gently remove lash without pulling and repeat if necessary. CAUTION: Use only as directed. Keep away from children. Avoid getting into eyes. If contact occurs, wash immediately with lukewarm water. Do not use cotton swabs. Ardell® false eyelashes have been a favorite of professional makeup artists for decades. The Professional Natural Fashion False Eyelashes instantly make eyes appear bigger and help dress up looks for any occasion. Ardell® Fashion Lashes allow you to create gorgeous lashes with minimal effort. Ardell® false eyelashes have been a favorite of professional makeup artists for decades. The Ardell® Professional Wispies False Eyelashes feature an invisible, lightweight band that connects the hair strands to form a strip that ensures secure corners. They are knotted and feathered by hand for perfect uniformity and absolute comfort for a beautiful natural look. Ardell® false eyelashes have been a favorite of professional makeup artists for decades. These double flare individual false eyelashes feature over twice as many lash strands for more dramatically intense eyes. These individual lashes are also permanently curled, waterproof, comfortable to wear and easy to apply. Each set contains 56 individual knot-free lashes. Available in short (Part # 513541), medium (Part # 513542) and long (Part # 513543) lengths. Ardell® false eyelashes have been a favorite of professional makeup artists for decades. These individual false eyelashes are perfect for adding length and volume to existing lashes. These individual lashes are also permanently curled, waterproof, comfortable to wear and easy to apply. Each set contains 56 individual knot-free lashes. Available in short (Part #513544), medium (Part # 513545) and long (Part # 513546) lengths. Ardell® false eyelashes have been a favorite of professional makeup artists for decades. 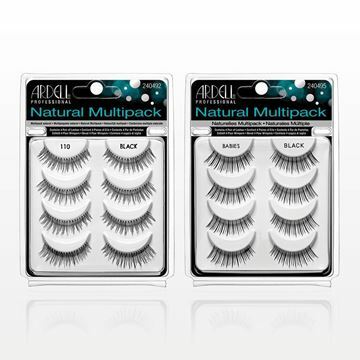 These multipacks include 4 pairs of Ardell® False Eyelashes presented inside a white tray with a convenient, clear reclosable clamshell. No adhesive needed! 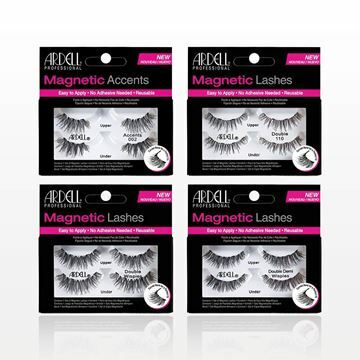 Ardell® has now designed magnetic lashes that are reusable and easy to apply. To Use: Place the upper lash on top of your natural lash line and the under lash beneath you natural lash line. Small thin magnets on each lash band will connect the upper and under lashes together. To Remove: Carefully slide top and bottom magnets away from each other. Do not pull. Store lashes in tray when not in use. 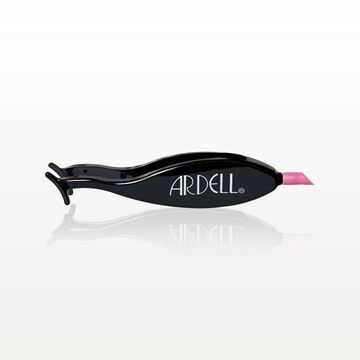 Apply and secure magnetic lashes with this easy-to-use Ardell® Professional Magnetic Lash Applicator. Directions: Attach upper and lower magnetic lash to applicator prongs. Position the upper prong above your natural lash and lower prong directly beneath it. Press prongs together and quickly release to connect upper and lower lashes.